The Inner Joy Essence... Use this essence to help create greater joy & light in your life. The Male Essence... 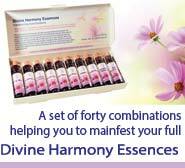 Helps to strengthen and balance the inner masculine principle in both women & men. The Motivation Essence... Helpful for those who feel a lack of positive motivation or inspiration in life. The New Horizons Essence... For those who need help to initiate or support change in their lives. The Open to Receive Essence... Helps to transform poverty consciousness into abundance. The Restoring Patience Essence... Dissolves vibrations of impatience, frustration & irritability. The Self Responsibility Essence... Use this essence to help transform feelings of resentment. The Spontaneity Essence... Promotes greater positivity, spontaneity & joy in life. The Transforming Addiction Essence... Supports the transformation of addictive behaviour of all kinds.